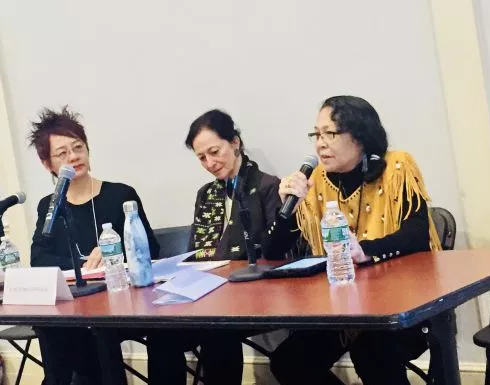 The symposium, held at Columbia University on April 21, 2018, underlined the link between language revitalization, Indigenous lands, and the recuperation of Indigenous knowledge. It highlighted the critical work done by researchers, educators, institutions, organizations, and communities towards making meaningful headway in actualizing language justice. The symposium was organized around the major topics of indigenous languages in education, language revitalization, and encouraging case studies. “Languages are a critical part of identity, necessary not only for communication, but to transmit the epistemic resources, ways of living and knowing, and cultural traditions of indigenous peoples and their communities,” says Amanda Earl, Rapporteur of the University Seminar on Indigenous Studies. “We must move from the macro level of codifying language as right in policy and law to holding states accountable for compliance with and implementation of mechanisms to protect, preserve, develop, promote, and revitalize Indigenous languages and their speakers themselves. The symposium was part of the Sawyer Seminar on Global Language Justice funded by the Andrew W. Mellon Foundation, a two-year program initiated by the Institute for Comparative Literature and Society and implemented in collaboration with the Indigenous Peoples’ Rights Program at the Institute for the Study of Human Rights. Listen to the Opening Ceremony with Chief Clara Soaring Hawk on iTunes U. Watch the Closing Plenary of the Globlal Justice for Indigenous Languages Symposium below or view more videos from the symposium on Youtube.